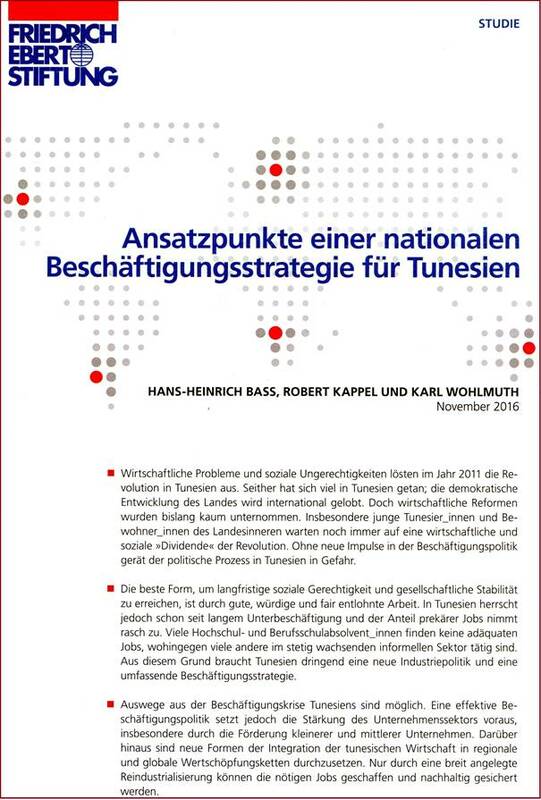 Professor Karl Wohlmuth is co-author of a new study on employment creation in Tunisia. This is a reworked version of the study which was published in 2016 in German, Arabic and French languages. 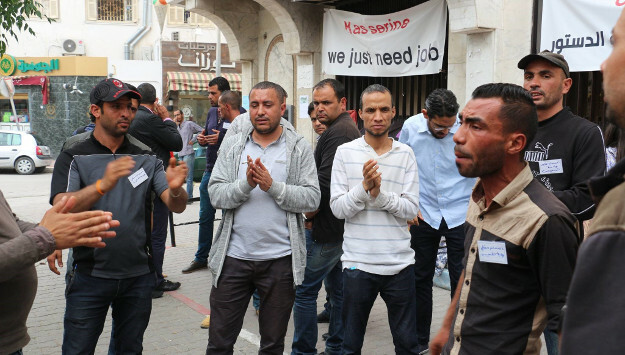 Main issue is how to develop a new employment strategy for Tunisia amidst dangers of increasing unemployment and spreading political instability. The authors provide a frame for employment policies consisting of three strategic elements. Element One considers the long overdue need for a pro-active policy towards small and medium enterprises in Tunisia. Element Two addresses the need to integrate Tunisian enterprises in a more effective way into global and regional value chains. Element Three focuses on the need to start a broad-based reindustrialization process in Tunisia and to manage in a better way the deindustrialization process in the field of old industries. Also the trade policy and implementation issues of the proposed strategy are discussed. 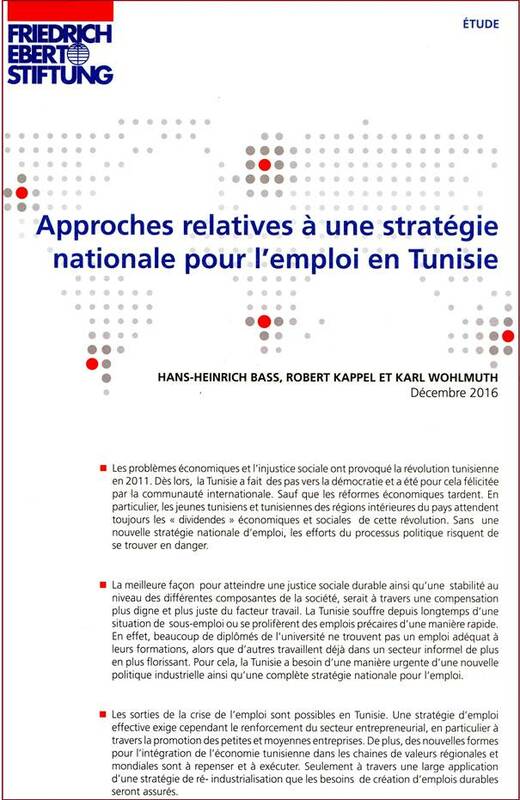 There is a great interest of Tunisian policymakers in this strategic approach towards employment creation. Governmental and non-governmental institutions in Tunisia and various donor agencies are working now on solid foundations for a an operational employment strategy and policy for Tunisia. 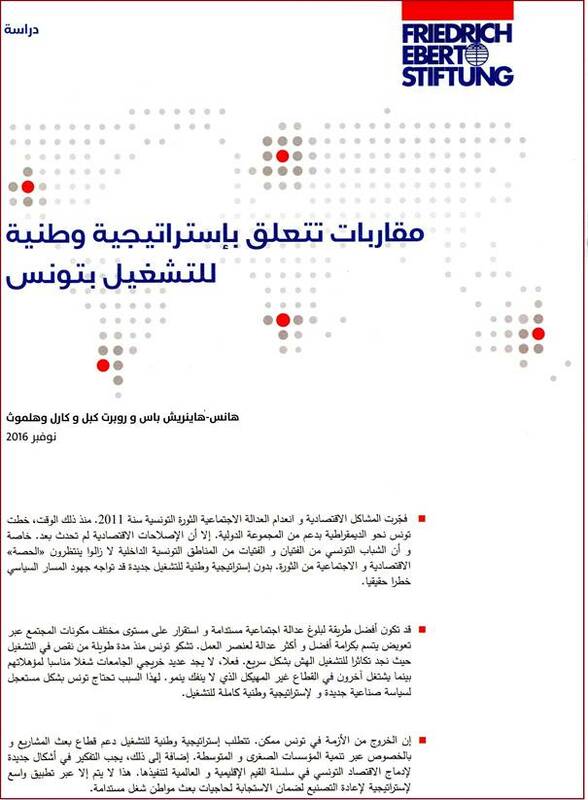 The Council of Economic Advisers of Tunisia has established a working group on these issues. 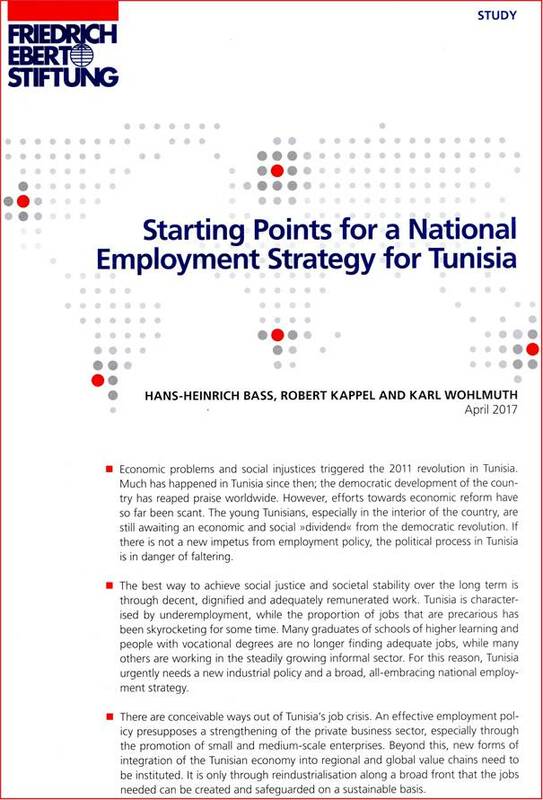 Despite of the importance of the employment issue not too many studies were done so far on employment policies for Tunisia. The National Dialogue on Employment of March 2016 raised the issue of employment creation again and presented an Eleven-Point Plan, and UN Secretary-General Ban Ki-moon emphasized during the meeting the necessity to keep the theme of job creation at the centre of policymaking to preserve Tunisia’s democratic gains (see the report by Mabrouka M’Barek: More Jobs, Higher Wages Essential for Tunisian Growth, Middle East Institute, May 20, 2016, Web Access: http://www.mei.edu/content/article/more-jobs-higher-wages-essential-tunisian-growth). The debate about the role of global value chains (GVCs) in African development is still ongoing. All international and regional development organizations have something to say on these issues, and there are proposals and demands addressed to African policymakers how they could use the integration into GVCs for income growth, productivity growth, employment creation, poverty reduction, and trade diversification. GVCs are now considered as a major tool to reach inclusive growth in Africa. World Bank and OECD refer to inclusive GVCs; the African Economic Outlook for 2014 (by OECD, African Development Bank, and UNDP) links GVCs with successful industrialization in Africa; the World Economic Forum refers to policies which allow for tapping the potential of GVCs for African development; ILO investigates the employment opportunities being associated with a deeper integration into GVCs; OECD, WTO and World Bank analyse the challenges, opportunities, and policy implications of GVCs; OECD addresses those instruments which may help policymakers in developing countries to pursue their GVC agenda; UNCTAD outlines policies to integrate developing countries’ SMEs (small and medium enterprises) into GVCs; WTO addresses the tasks of policymakers to manage GVCs in a changing world economy; UN’s Department of Economic and Social Affairs (UN-ESA) looks at ways to strengthen capacities of policymakers to develop competitive value chains; the African Development Bank considers the options of policymakers for climbing value chains; UNIDO relates GVCs to agroindustry development; and UNECA looks at policy implications for promoting global value chains (GVCs) and regional value chains (RVCs).The list could be continued, as there is a rich collection of guidelines available now for promoting integration of local enterprises into GVCs. Professor Karl Wohlmuth has published a report in the journal “Berichte” to synthesize some of these views. The report is done in the form of a Guide for Policymakers enabling them to exploit by coherent policies the opportunities for African Development of integrating local enterprises into GVCs. The report draws on recommendations of international organizations and on lessons from case studies which were written for the volumes 18 and 19 of the African Development Perspectives Yearbook. Wohlmuth, Karl, 2016, Global Value Chains and African Development – Key Issues addressed to Policymakers, pages 4-30, “Berichte”, 2016, Volume 26, Number 210, ISSN 1022-3258, Berlin, IWVWW e. V.
The report has two parts. In part one basic issues of global value chains (GVCs) when interacting with African local economies are discussed. Major questions are: How can Africa develop capabilities and preconditions for a beneficial integration of its producers into global value chains? 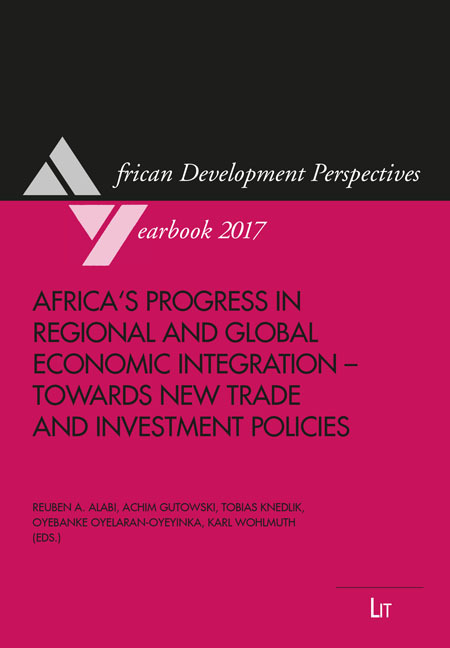 What do we know about the depth and the forms of Africa’s integration into regional and global value chains? Are the sub-regional and local development impacts of Africa’s participation in regional and global value chains gainful? In order to guide the policymakers on GVCs it is necessary to collect information on these issues first. In part two some strategic implications of the analysis are presented, with the purpose to formulate the core elements of the guideline. Five priority areas for action emerge and have to be considered by policymakers so that the African country and its enterprises can gain from global value chains (GVCs): First priority is, Developing the Key Capabilities for GVC Participation; second priority is, Identifying the Power Structures within the GVCs; third priority is, Assessing the Relevance of the Various Transmission Channels; fourth priority is, Using more fully the GVC Anchors and GVC Hubs in Africa; and fifth priority is, Making Regional Integration work for deeper GVC Participation. Important is the way how these five elements are bundled together in a comprehensive strategy by the policymakers. All these five strategic imperatives have high cost in terms of administrative burden, manpower needs, leadership, and visionary power. So, it can be envisaged that for many African countries integration into global value chains (GVCs) will remain a dream, not becoming reality in the next few years. Other countries are developing and exploiting such potentials to integrate their enterprises into GVCs, like some North African and South African countries, and some few West African and East African countries, but this will be a select list of countries. However, even the successful countries in Africa will make progress in regard of GVCs only with regard of some product niches, some tasks, specific sectors and sub-regions, and a select group of enterprises. It will be necessary for all of them to learn from small successes and not to be discouraged. 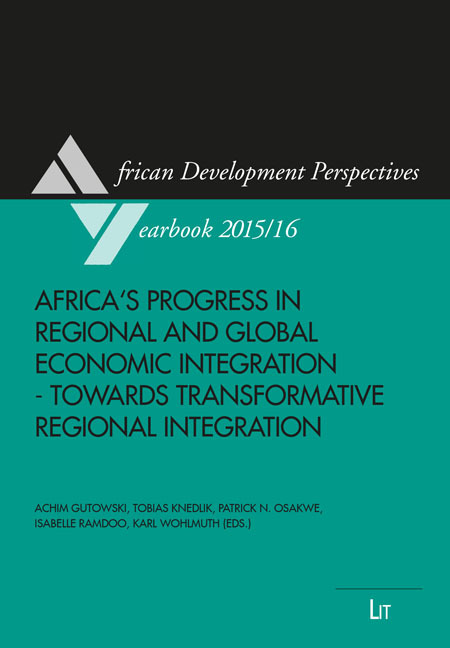 The report benefitted from the lessons of several case studies in volumes 18 and 19 of the African Development Perspectives Yearbook (see above, and see the link to the Publisher and to the Editor of the Yearbook volumes: http://www.lit-verlag.de/reihe/adpy and http://www.karl-wohlmuth.de/african_development_perspectives_yearbook/). Country cases for Sudan, The Gambia, Ghana, Tunisia, and Botswana highlight the preconditions for a successful integration into GVCs, in terms of macroeconomic policy formation, human resources development, trade and industry policy formation, spatial development policies, and technology and innovation policy formation. Because of the great international interest in the topic WITS UNIVERSITY PRESS at UNIVERSITY OF THE WITWATERSRAND, JOHANNESBURG has published a South Africa edition in 2017. The University of the Witwatersrand in Johannesburg has an outstanding reputation as a leading university in Africa. 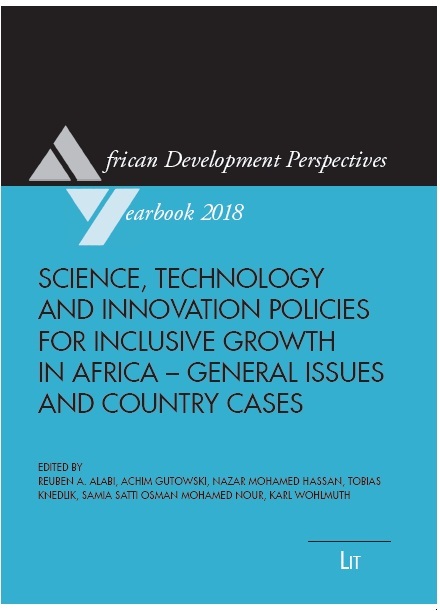 Professor Oluyele Akinkugbe, University of the Witwatersrand, South Africa and Professor Karl Wohlmuth, University of Bremen have contributed to this book with a chapter on “Africa's Middle Class, Africa's Entrepreneurs and the Missing Middle”. This study is based on researches about the growth of Africa’s Middle Class and the impacts on the development of Africa’s Entrepreneurship. Specifically, the chapter investigates the role of Africa’s Middle Class for closing the “Missing Middle”, the gap between the few large and the many small and informal enterprises in Africa. The question is raised if the growth of Africa’s Middle Class will contribute to the growth of African enterprises so that the “Missing Middle” development trap can be overcome. An analysis of African enterprises and entrepreneurs is presented, by type of economic characteristics (survival versus growth-oriented enterprises) and by type of economic motivation (necessity-driven versus opportunity-driven entrepreneurs). The purpose of the analysis is to assess if the growth of Africa’s Middle Class will create a viable entrepreneurship sector and a dynamic class of entrepreneurs. Also the role of development policy is investigated in this context; it is asked if and how public development policies can support the growth of African enterprises and of a dynamic African entrepreneurial class. It is also asked to what extent these new African enterprises and African entrepreneurs are rooted in the growing African middle class. 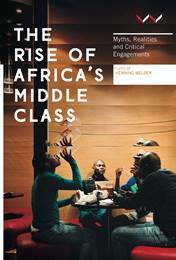 The book, which was edited by Professor Henning Melber, a lead expert on Southern Africa, with the title “The Rise of Africa’s Middle Class – Myths, Realities and Critical Engagements” was first published 2016 at Zed Publishers: https://www.zedbooks.net/shop/book/the-rise-of-africas-middle-class/ and is distributed by The University of Chicago Press Books: http://press.uchicago.edu/ucp/books/book/distributed/R/bo25073345.html. The book is a critical analysis of the Africa Rising/Rise of Africa’s Middle Class Paradigm. First book reviews are coming in (see: http://witspress.bookslive.co.za/blog/2017/04/26/roger-southall-reviews-the-rise-of-africa%E2%80%99s-middle-classes-myths-realities-and-critical-engagements/ and https://www.pambazuka.org/economics/understanding-africa%E2%80%99s-middle-classes-book-review and http://blogs.lse.ac.uk/africaatlse/2017/04/07/book-review-the-rise-of-africas-middle-class-myths-realities-and-critical-engagements-by-henning-melbered/). See also the related report by Editor Henning Melber on Africa’s rising middle class: time to sort out fact from fiction in The Conversation (of May 24, 2016). The report (Link: https://theconversation.com/africas-rising-middle-class-time-to-sort-out-fact-from-fiction-59797) gives an assessment of the issues, but also outlines the interdisciplinary approaches needed to analyse the subject properly..
Wohlmuth, Karl, 2014, African Lions, African Tigers, and Emerging African Middle Classes – A Very Sceptical Note Extended, pp. 4-32, in: Berichte, Oktober - Dezember 2014, 24. Jahrgang, Nr. 205, Schwerpunktthema des Heftes: Diskussionswert: sich differenzierendes Afrika, Geopolitik und Menschenrechte, internationales Krisenmanagement und das wesentlich Unsichtbare, Berlin: Forschungsinstitut der IWVWW e. V.
An extended version of the essay “Africa's Middle Class, Africa's Entrepreneurs and the Missing Middle” was published in November 2016 in an IWIM Publication Series (see for bibliographic details): Wohlmuth, Karl/ Oluyele Akinkugbe, 2016, Middle Class Growth and Entrepreneurship Development in Africa – Measurement, Causality, Interactions and Policy Implications, November 2016, 36 S., "Weiße Reihe" des IWIM, Andreas Knorr, Alfons Lemper, Axel Sell, Karl Wohlmuth (Hrsg. ): Materialien des Wissenschaftsschwerpunktes "Globalisierung der Weltwirtschaft", Bd. 43, November 2016, ISSN 0948-3837 (ehemals: Materialien des Universitätsschwerpunktes "Internationale Wirtschaftsbeziehungen und Internationales Management"). 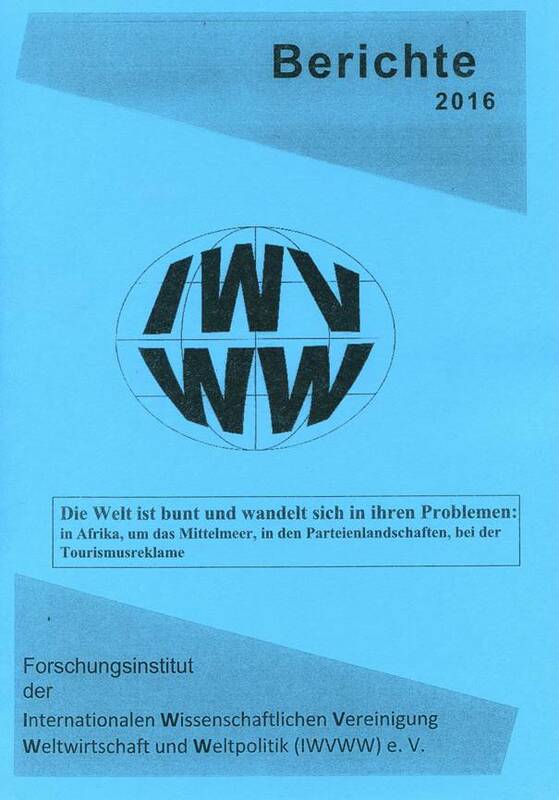 PDF and Download are available at: PDF and Link to the IWIM Publication Series: http://www.karl-wohlmuth.de/weisse_reihe/. This extended contribution is accepted for publication in the journal “Berichte” for Number 1, 2017. It is a forthcoming publication. Research Project One: ‘Cassava Production, Processing, Fortification and Acceptability in Nigeria’, a publication for Volume 20 of the African Development Perspectives Yearbook. He is also one of the Volume Editors and Unit Co-Editor for the Unit on Nigeria in Volume 20. Volume 20 will appear for 2018, while Volume 21 will be ready for 2019. Professor Alabi will also assist in the work for Volume 21. Research Project Two: He will conduct researches on ‘Impact of State Government Public Expenditures on Yam Productivity and its Implications on Food Security in Nigeria’. In this context he will also organize a Policy Workshop in Nigeria. The intention is to inform the policymakers, the civil society, and academia about the policy implications of these researches. Focus is on the role of state level public finances in contrast to analyses of the federal level public expenditures. Research Project Three: He will also conduct researches on ‘How to Address Youth Unemployment in Nigeria by Using Agricultural and Business Technologies’. Also this project will lead to a Policy Workshop in Nigeria. The intention is to inform the policymakers, the civil society and academia about these researches. As growth has not contributed to employment creation in Nigeria, this project will link directly employment policies for the youth and agricultural development policies to enable young entrepreneurs. We examined the pro-poorness of the newly introduced e-wallet fertilizer scheme in Nigeria. The study made use of the Nigeria General Household Survey (GHS)-Panel Datasets of 2010/2011 and 2012/2013 which contain 5000 farmers in each the panel and supplemented it with Federal Ministry of Agriculture and Rural Development (FMARD) data on fertilizer subsidy. We determined the pro-poorness of the scheme by estimating its benefit incidence and concentration index, and estimated the impact of the scheme on fertilizer use, output and yield of the participating farmers using the propensity score matching (PSM) methodology. We found that the e-wallet scheme was able to register about 70% of the expected number of registered farmers, while the roll-out and redemption rates stood at 79% and 69% respectively. The proportion of farmers who used fertilizer in Nigeria declined from about 39% in the pre-wallet scheme to 38% during the e-wallet scheme. The percentage of farmers that used subsidized fertilizer also decreased from 13% in the pre-wallet era to 12% during the e-wallet scheme. We indicated that the concentration indices of fertilizer subsidy before and during the e-wallet schemes were 0.0328 and 0.0168 respectively. Since they were positive, it means that their distributions are not pro-poor, but fertilizer subsidy with the e-wallet scheme is more pro-poor than the pre e-wallet scheme because it has a lower concentration index. While the largest-scale farmers shared 23% in the fertilizer subsidy before and during the e-wallet schemes, the share of the smallest-scale farmers were 18% and 19% in the fertilizer subsidy before and during the e-wallet scheme respectively. This may explain the relative pro-poorness of e-wallet over the pre-e-wallet scheme. However, the e-wallet scheme was not pro-poor in absolute terms because the share of the largest farm size group of farmers was higher than the share of the smallest farm size group during the e-wallet scheme. The study showed further that the share of the rural area in the fertilizer subsidy was about 39% and 41% before and during the e-wallet scheme respectively. The study demonstrated that the fertilizer subsidy distribution is not pro-poor in the rural area and in the South-South, North-West and North-Central regions of Nigeria. The study revealed further that the participating farmers in the e-wallet fertilizer scheme used more fertilizer than non-participating farmers in the range of 278kg to 293kg per farmer. The output of the participating farmers was significantly higher by 827kg but there were not significant differences in their farm productivities. The study revealed that the small and the smallest farm holders who contributed about 70% of the total yield of all the farmers shared only 39% of the subsidized fertilizer during the e-wallet fertilizer scheme. This non-pro-poor distribution of subsidized fertilizer has been implicated for non-significant differences in the farm productivities of participating and non-participating farmers in the scheme. The study concluded that, though the e-wallet scheme is more innovative and transparent than the previous fertilizer subsidy scheme, some factors that limited the pro-poorness of the past fertilizer subsidy scheme are still inherent in the e-wallet scheme. In order to improve the impact of the scheme on food crop productivity and on food security, the study recommended how the pro-poorness of the e-wallet scheme can be addressed with special reference to the rural area, the South-South, the North-West and the North-Central regions. Professor Alabi holds various research awards and international scholarships: Research Grant from Bilateral Cooperation in Education and Research (Internationales Büro des BMBF, Bonn, Germany; Georg Forster Research Fellowship Award of the Alexander von Humboldt Foundation (AvH Foundation), Bonn, Germany; Innovative Research Grant from African Growth & Development Policy Modelling Consortium (AGRODEP-IFPRI), Washington D. C., USA; Research Grant from the African Economic Research Consortium (AERC), Nairobi, Kenya; Research Grant by the Partnership for Economic Policy (PEP) Research Network, Quebec Canada; and Excellence in Publication Grant from African Growth & Development Policy Modelling Consortium (AGRODEP-IFPRI), Washington D. C., USA). He also has applied for funding for the projects in the new research period in Bremen (2018 – 2020). Professor Karl Wohlmuth is advising the research activities of Professor Alabi now since 2004. In this year the cooperation started between the universities in Ekpoma, Nigeria and in Bremen, Germany at the occasion of a Research Workshop on African Development. Professor Alabi has published in most of the publication series of IWIM (Book Series, African Development Perspectives Yearbook Series, Blue Discussion Paper Series, and White Discussion Paper Series).